Seaview Golf & Country Club originally opened in 1950 as a 9-hole golf course off of Seaview Drive. Then known as Northside Golf & Country Club, it was the culmination of time and effort from founder Dr. Harold J. Davidson and a group of his friends. Little did they know, they were laying the groundwork for a facility that would be enjoyed by golf enthusiasts for the next 69 years, and many more to come. Founding committee members included Arthur Bill – who first conceived the idea of a golf club on the Northside – Reginald Allen, George F. Leonard Sr., James A. Angel and Sidney Jackson. Davidson personally built inroads with people from the North side, Sydney, and Glace Bay area, recruiting fifty people who would become the courses first charter members for $100 each. These funds were used to construct the first nine holes on the same site being used today, courtesy of a fifty-year lease on thirty-nine acres of land arranged by Sidney Jackson. Under the guidance of the founding committee and the charter members, a scenic nine-hole course was built, and for the first time, golf was officially underway on the Northside. Shortly after in 1953, a picturesque log style clubhouse was built under the supervision of founding committee member George Leonard Sr. This marked the next phase of the club, as $12,000 in shares were sold to raise the appropriate funds, and the Club officially become incorporated. In early 1960, shareholders agreed to cancel their shares, and turn ownership over to the general membership. Fittingly, the name was changed to Seaview Golf and Country Club, and membership grew to an additional 200 new members. In 1965, membership at the course was growing steadily along with the popularity of the sport. The club began to consider future expansion, and adjacent portions of property were purchased from neighbouring residents. Between 1970 and 1972, the land was cleared and early development began. Coincidentally, during this same time, a curling rink was planned and developed adjacent to the clubhouse, opening in 1970. Creating an additional nine holes saw its share of challenges. Membership growth leveled off, and the required clearing and development work was spread out and concentrated over a number of years. In July of 1985, a tragic fire completely destroyed the clubhouse and curling rink. The club was now facing adversity like it has never seen before. Undaunted, President Charlie Reid and his Board of Directors, with the help of the ever-energetic Aber Joseph, had the foresight to push forward. The clubhouse was rebuilt, and the curling operation was discontinued. Despite the upheaval caused by the fire, the construction of the new holes continued. Aber’s dedicated expansion committee included Stan McInnis, Charlie Morrison, Harold Engel, Club Pro Lorne Jennex, and Course Superintendent Brian Clark. Together the team was able to complete the additional four holes before the close of the 1988 season. With the right team in place, and a drive to succeed, Seaview now had plans for a final 18-hole layout projected to be complete and ready for play by 1992. The mid 90’s saw two extremely hot consecutive summers. Seaview’s happy members had finally settled into an 18-hole facility, and weren’t ready to let anything jeopardize the course everyone worked so hard to build. The members reinstated their commitment to the club, and embarked on a new project of installing a sprinkler and watering system for the course, once again demonstrating their loyalty to Seaview’s success. The late 90’s and the new millennium saw an exponential boom in golfs popularity, during which time Seaview had in excess of 800 members. A strong base of members allowed the club to turn ambitious visions into realistic new projects. A brand new Pro-Shop was constructed, along with an on-course canteen, two on-course washrooms, a driving range, a new maintenance building and a number of enhancements to the course. These projects and enhancements continue today, always with the vision of improving our facility to keep our members happy. As a testament to what its creators and members have accomplished over the past 69 years, Seaview has been selected by the Nova Scotia Golf Association to host a number of provincial championship events such as The Nova Scotia Amateur Championship, The Nova Scotia Mid-Amateur Championship, The Nova Scotia Junior Championship for both boys and girls, The Nova Scotia Ladies 4-Ball Championship, and the Men’s Senior 4-Ball Championship. In addition to hosting competitive and corporate golf tournaments, Seaview has become home to many large events and annual fundraisers to charitable organizations such as the Canadian Cancer Society and the Northside Harbourview Hospital Association. Seaview prides itself in being a strong supporter of Junior Golf and conducts an annual auction in support of the Junior Program that has become growingly popular in the community. Seaview has also developed a Pre-Junior golf program designed to teach and instruct 6-9 year olds, ensuring the longevity of the game. Our Club proudly employs 28 local people in the fields of golf operations, course maintenance and service. Thanks to our members and supporters, Seaview Golf and Country Club is well known as one of the best golfing experiences on Cape Breton Island. 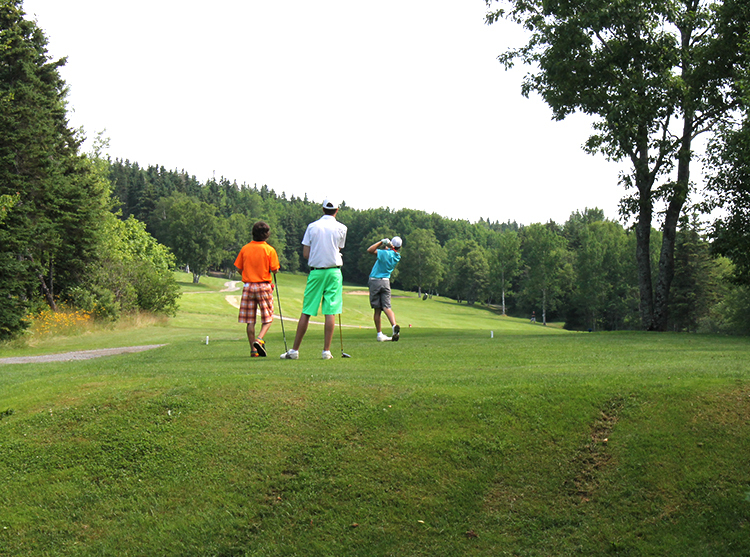 It’s relaxed atmosphere and challenging layout will provide golfers of all skill level who visit Cape Breton Island an experience they will never forget!